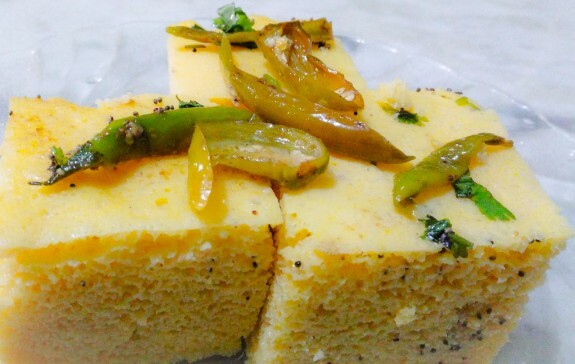 Find out the simple steps for soft, spongy and delicious Khaman Dhokla. You can use this both for breakfast as well as tea time snack. 1. Take a Bowl and add Gram flour, yogurt and approximately 1 cup of warm water into it. Mix properly to avoid any lumps. Add little salt and mix it. 2. Leave it for 3-4 hours. When the gram flour mixture is fermented, add Turmeric powder and green chili paste into it. Mix it well. 3. In another bowl, take lemon juice, 1 tsp oil and soda bicarbonate or eno. Mix it well and add it to the batter. Whisk everything briskly. 4. Now heat the steamer and grease a thali. Pour batter into the greased thali and place it in the steamer. 5. Cover it and steam it for 10-15 minutes. . If you are using any pressure cooker or pan, then steam it for 15-20 mins on a medium flame. 6. To check whether it has been done or not, you can insert a tooth pick and if it comes out clean, the Dhokla is ready. But if there is any batter in the toothpick, then you need to steam it more. 7. Remove from heat and when it gets cold, cut into squares and keep it in a serving plate or bowl. 8. Heat the remaining oil in a pan and add mustard seeds. When it crackles, add green chilies and 1 tsp sugar. Mix it well and add chopped coriander leaves. 9. Pour it over the Dhoklas and present it.